The Mac universe is filled with lots of free and low-cost software—what we like to call Mac Gems. Macworld Senior Editor Dan Frakes covers a couple of programs each week on the Mac Gems Weblog, but Macworld's editors uncover many more jewels in our day-to-day software mining. Over time, we've accumulated a list of Gems too long to cover with just two reviews a week. We want to get the word out about these Mac Gems (and it just so happens that Dan will be away from Macworld for a month). Starting today, and every day until mid-August, the Macworld staff will briefly cover a Mac Gem each day—a Gem-a-Day, if you will—on the Mac Gems blog. Some products will be simple items that may not warrant a full-length review, some will be niche products, and some will just be things that have been waiting too long for coverage. The one thing they all have in common is that they are all Mac Gems. The Mac Gems being showcased over the next few weeks are part of a big feature that we will be published in our September 2008 issue. Pick up a copy if you're interested in seeing the list in its entirety. 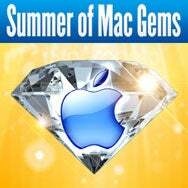 You can also go to the Mac Gems home page for a list of past Mac Gems. Dan's regular Mac Gems column will resume in mid-August.